Contrary to what the name implies, a person who is long-sighted has blurred vision when looking at close objects, unless they make a constant effort to focus, which can lead to strain, headaches, and eye fatigue. 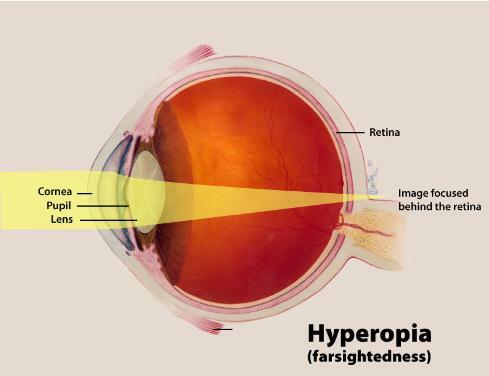 Long-sightedness or hyperopia happens when the eye is shorter than normal. This shape causes images to be focused behind the retina, rather than on it. It is a common condition that most often is inherited. As a result, the lens of the eye must exert effort to focus the image on the retina. Babies and children are usually slightly long-sighted; as their eyes grow and lengthen, the condition corrects itself, generally by age seven or eight. Young adults who remain long-sighted often don’t realise their condition because they have enough flexibility in focusing power to correct the condition without the aid of spectacles or contact lenses. At first, symptoms may be undetectable or very slight. With age, increased difficulty seeing near objects may be noticed until eventually even distant objects appear blurred. Photo courtesy of National Eye Institute, National Institutes of Health.